From the beginning, students are guided towards understanding how instruments perform at their best, how the tools do their work and why the materials can be made with the shape, the strength or the lightness required. 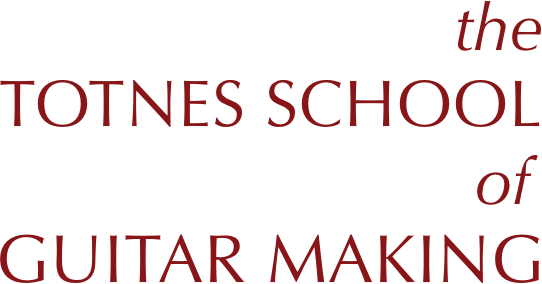 Recognising properties of materials, tools and the finished guitar, and learning how to handle them is the heart of the course. 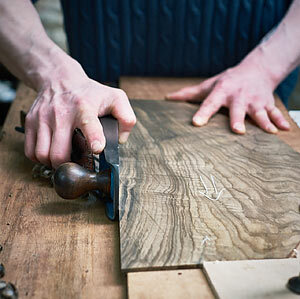 In order to do this well, the work is done almost exclusively with hand tools using traditional methods. This has the added benefit of ensuring a comfortable environment in which to share ideas and information and the methods learnt can then be repeated without a large investment in machine tools. Even students who have barely or never picked up a chisel before usually find no great difficulty in using them. Once shown the correct way to set up and use a tool for the task in hand the work makes sense. And with repetition comes familiarity and confidence that it will work. The realisation that great accuracy - and with practise, speed - can be achieved with simple tools makes the work immensely satisfying. I believe the finest work is done by hand. 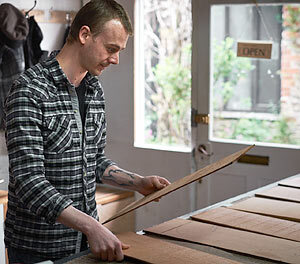 In any case, however much machine tools and jigs may be used in a modern instrument maker's workshop to aid productivity, the use of hand tools remains the bedrock of the craft and a vital way to learn. Small power tools are used where appropriate. 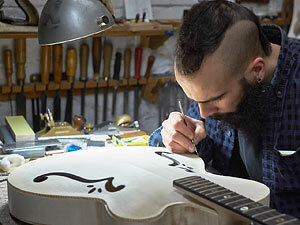 Simple tasks such as boring holes for machine heads (tuners) or routing cavities for pickups are examples of this. Cutting the rebates around guitars for decorative binding can be done by hand, but is more consistent when cut with a router. And lacquering finished instruments is simply not feasible without a spraygun powered by compressed air. With all tools, safety is held equally important with skill in their use. With Phil's solid support, students take charge of every aspect of their work. From decisions about design, including what materials are to be used, they progress to making every part of the instrument themselves. 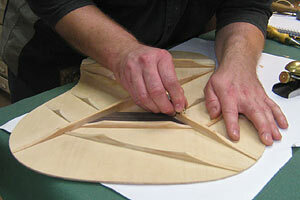 When the time comes for separate parts to be glued together, the job might seem to be nearly done. In fact, there is much left to do. Setting in corner binding is followed by that part of the whole business which is most like precision engineering: making a fretboard and a suitably low playing action to such a degree of accuracy that the strings will not buzz. 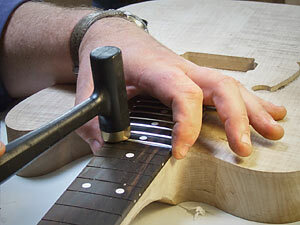 A jig enables fret slots to be cut beautifully straight, but the trueness of the fretboard, which allows a low action and clean sound, is the result of careful measurement and skilful technique. A number of students make as fine a job of it as is physically possible. Equally important, having an clear technique allows any one of them to perfect the skill over time. 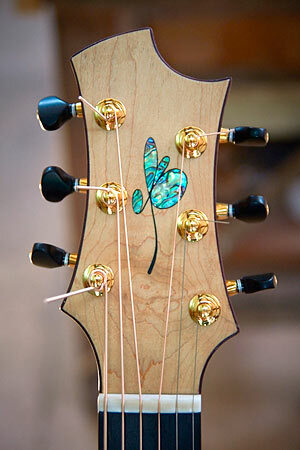 The result is that playability of finished instruments is regularly of an extremely high standard. If earlier stages are about artistry, and contribute to style and the kind of sound the guitar will have, this part delivers the purity of sound, and makes the instrument a dream to play. Finally there is finishing. With two weeks to go it would be wonderful to report that things were winding down, that skills learnt earlier were being honed and exercised. In reality, an entirely new technology, with new materials, is about to be learnt. Often this is spraying lacquer. But students can learn french polishing, or varnishing, if the instrument calls for it. With the final stringing of each guitar comes the moment. They have already been heard, at a trial-stringing stage (which is before lacquering), but that takes nothing away from the now completely finished article. With no more work to do, the maker can enjoy the fruit of their twelve weeks hard work.